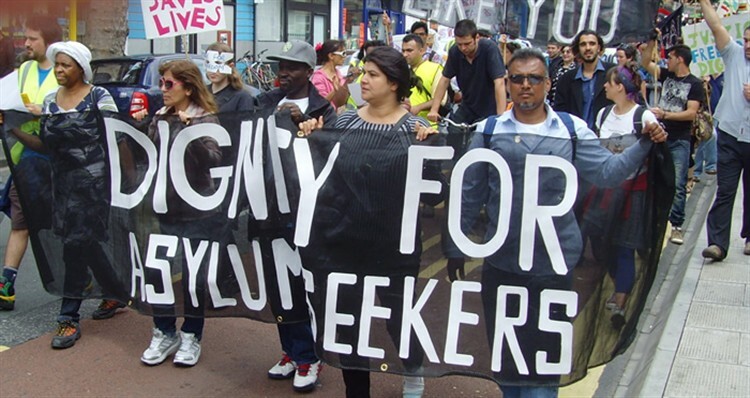 Asylum seekers march for dignity. Image: Bristol networks. Asylum seeking students are to be offered scholarship funding by the University of Strathclyde starting this academic year. This is the first asylum seekers’ bursary scheme in Scotland. Asylum seekers are not usually eligible for student funding and have significant restrictions on working rights, facing difficulties and delays in progressing to higher education while they await a decision on their immigration status from the Home Office. SAAS currently only provides funding to students who submitted their application to the Home Office before October 2006. The scholarship will be offered to up to three students per academic year. The financial support package covers tuition fees and other study-related costs, such as textbooks, equipment and travel costs. The fund was proposed and campaigned for by the University of Strathclyde Students’ Association (USSA) and developed in co-operation between the University, the Union and the Scottish Refugee Council (SRC). Ms Salih, from Kurdistan, was one of seven secondary school pupils whose 2005 campaign to raise awareness about asylum seekers’ experiences inspired the hit musical The Glasgow Girls. It led to the fifth and sixth-year pupils twice visiting the Scottish Parliament and winning Best Public Campaign at the Politician of the Year awards. One of the first students to be selected for the scholarship is Angeline Mwafulirwa (39). Ms Mwafulirwa, who is still seeking asylum, is originally from Malawi – she has been in Scotland for eight years and now lives in Springburn. Angeline is now studying a postgraduate degree in law. She told the Herald: “I am delighted to get this financial support. It means so much because, apart from adding value to myself, I am also looking at benefiting the wider community. Dr Veena O’Halloran, Director of Student Experience and Enhancement Services at the University, said: “Strathclyde was founded as a place of useful learning for all, regardless of background or means, and we are proud of our long history of breaking down barriers to education. Only students who are not eligible for financial support from England, Scotland or Wales will be considered for the new bursary scheme. Posted in News and tagged asylum seekers, Glasgow, glasgow girls, refugees, roza salih, scottish refugee council, strathclyde, Strathclyde Students' Association, Strathclyde University, USSA. Bookmark the permalink.